Actor Michael J. 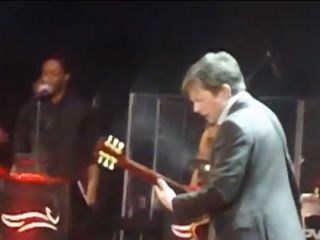 Fox, best known for his role as Marty McFly in 'Back To The Future', has recreated one of the most inspired guitar moments of cinema history by appearing on stage in New York to cover Chuck Berry classic 'Johnny B. Goode'. Stick with the video above and you'll see Fox, who has been battling Parkinson's disease for nearly twenty years now, prove that he's still got the chops to rip out a bit of Berry when required. Fortunately, half the audience was armed with camera phones and proceeded to capture (poor quality) audio and video of the event. This is just about the only scenario where TG believes the use of a camera phone at a gig is acceptable, and that's mainly because of the wealth of good tagline opportunities it's given us.